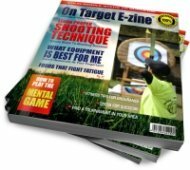 Should I Learn Archery With A Recurve Or A Compound Bow? What I still do not know is, should she be starting with a recurve or a compound bow? For some reason I have the feeling that she should start with a recurve, only because that is what I had when I was her age. Ultimately, I want her to have the opportunity to enjoy the activity and hope she will. It would be great if she became skilled enough to use it for whatever need arose. What would your professional opinion be on the type of bow for a beginner? Comments for Should I Learn Archery With A Recurve Or A Compound Bow? That's exactly what happened to my 12 year old son. He was not successful with a recurve bow - He wanted to shoot, as a beginner, accurately from 10 yards pulling 14 and he couldn't. I switched him to a compound bow (Genesis) and he's happy and successful. 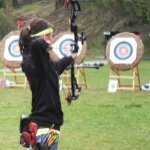 The decision to start with a recurve bow or a compound bow is a topic that is widely debated. My experience has been that the new archer who starts learning on a recurve bow will typically turn out to be a better archer. The recurve bow provides a lot more feedback for both the archer and the instructor meaning flaws in form and/or technique will almost always be easier to identify. Conversely, the compound bow has the effect of concealing minor (and sometimes major) flaws in drawing technique and execution particularly when a release mechanism is employed. In the past I would let the parent dictate what type of bow the new archer would use. Today I insist that all the archers who come through my entry level courses use a recurve for at least the first 12 or more lessons. The concepts and skills learned while using a recurve are unique but the student becomes more aware of motor skill and control in a shorter time frame. In the end if they choose to shoot a compound bow they will be a superior archer compared to someone who learns on a compound. Some might argue this point but my experience has shown that my students who start on a recurve bow before switching to a compound bow are in fact better archers. This can only be quantified by comparing the archers on my competitive team who shoot higher scores and have won more medals in competition than those who started out on a compound bow with no previous experience with a recurve. In closing all I can say is that it requires more motor skill and control to be an effective archer with a recurve bow than it does with a compound bow but ultimately the choice is up to the archer. If the student isn’t having FUN with a recurve bow then it's time to make the switch or the interest may start to diminish quickly.